Whether or not your home still has galvanized pipes, the appearance of one or more of the symptoms described above may mean it’s time to get new copper or plastic pipes. Most structures built 25 or more years ago were fitted with iron pipes coated with zinc, normally called galvanized pipes. As the galvanized pipes age, the zinc lining tends to erode allowing rust to form. Once galvanized pipes begin to deteriorate, they need to be replaced. 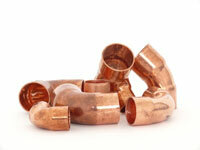 Most people prefer to replace galvanized pipes with copper pipes, in a process referred to as copper pipe work.